We've Released a 2018 Full Year Crypto Report! 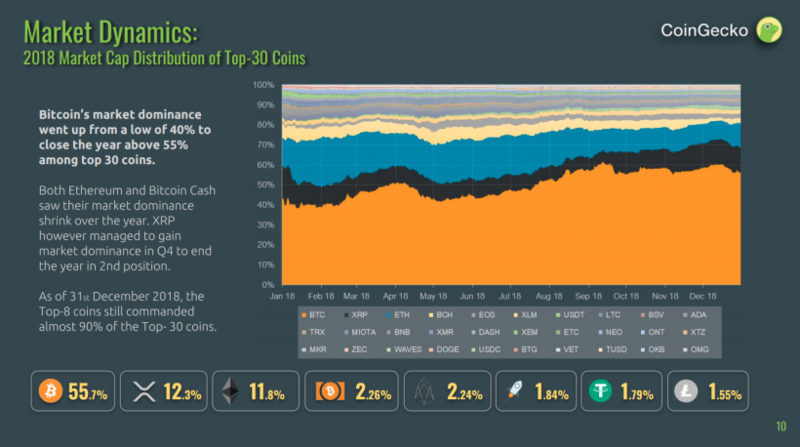 We are proud to announce that we have released the 2018 Yearly Crypto Report by CoinGecko.com. This is our 6th quarterly report and the second time we are making a full year report after the 2017 Yearly Report. In this whopping 83 page report, our team of researchers worked to provide insights covering the market in 2018. We partnered with @dapp.com to cover decentralized applications, TokenMarket to cover Security Tokens, Masternodes.Online covering masternodes, and Non-Fungible.com to cover Non-Fungible Tokens. @coingecko would like to take this opportunity to thank our partners for providing valuable insights into helping us with this report. 2018 was a very bearish year for the cryptoasset industry. The market capitalization of the top-30 coins fell on average 78.85% in 2018. Among the top 5 cryptoassets, Bitcoin Cash saw the worst loss where its price fell by 93%. We have a section (pages 39-42) looking deeper into the Bitcoin Cash split that caused this massive fall in value. EOS saw its value increase mid-year as it completed its gargantuan $4.2 billion ICO and geared up for Mainnet launch. However, after the initial excitement of the Mainnet launch, its price tumbled and ended the year 66% lower than the start of the year. As the market fell throughout 2018, we saw a “flight-to-safety” towards Bitcoin. Market dominance for Bitcoin went from 40% to above 55% by the end of the year. We also saw a stablecoin, Tether ending the year as one of the top 10 cryptoasset by market capitalization, ending the year as the 7th largest cryptoasset. 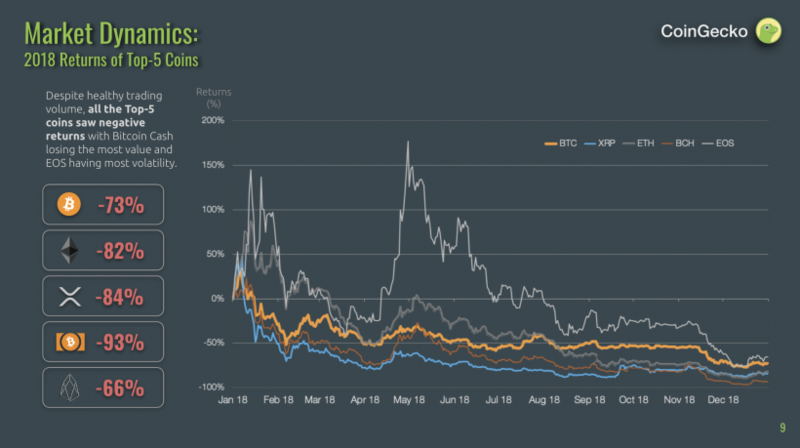 Towards the end of 2018, as the price of bitcoin and ether touched yearly lows, we saw ICOs struggling to raise funds. 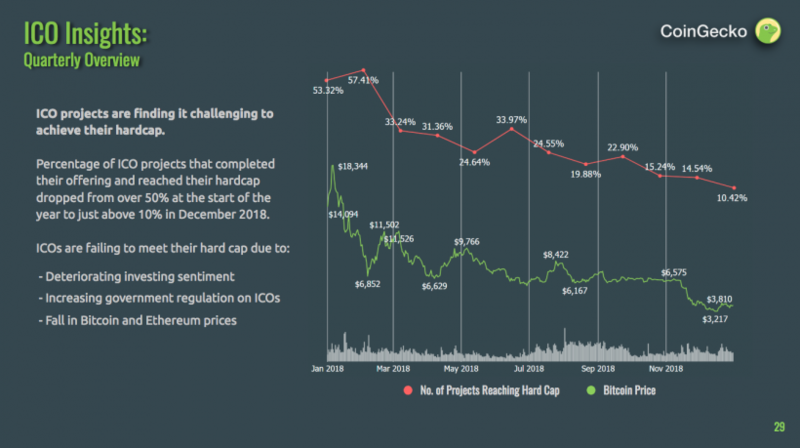 The percentage of ICOs meeting their hard cap decreased from around 53% at the start of the year to 10% by the end of the year. Among the projects that raised funds and successfully listed their tokens on exchanges, a majority of them saw their value decreased soon after. 2018 saw strong growth in decentralized applications (dapps). 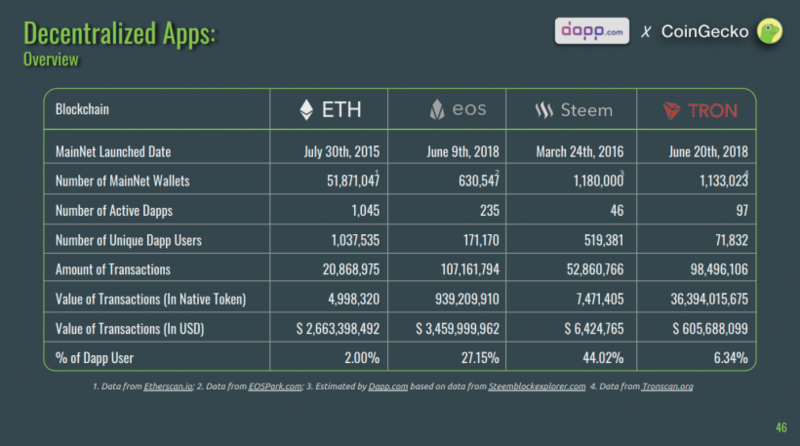 With the assistance of @dapp.com, we looked into the growth of dapps. In 2018, we saw the emergence of other smart contract platforms such as EOS and TRON. Both these platforms launched their mainnets in June 2018. Ethereum is still the leader with the most number of dapps but it will be interesting to monitor how it fares with more competition in 2019. Among dapps, most of the dapps created are games and in the betting space. TokenMarket prepared a section on Security Tokens. Security Tokens are a digital representation of a security where ownership is now represented on the blockchain. 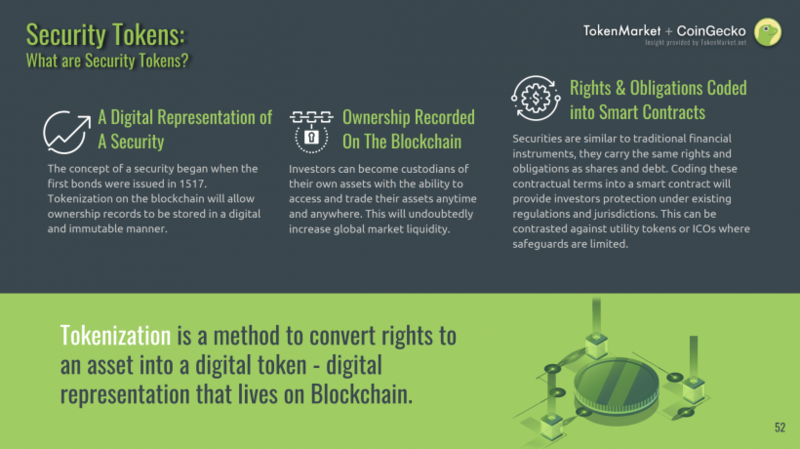 Rights and obligations can be coded into smart contracts. There is a lot of potential behind Security Tokens which have a good chance to increase global market liquidity. Masternodes.Online did some analysis of the largest masternodes and found that the top 4 masternode coins are privacy related ones. 2018 also saw strong growth in masternode coins where it went from 57 to 536 coins, representing almost a 10x growth. 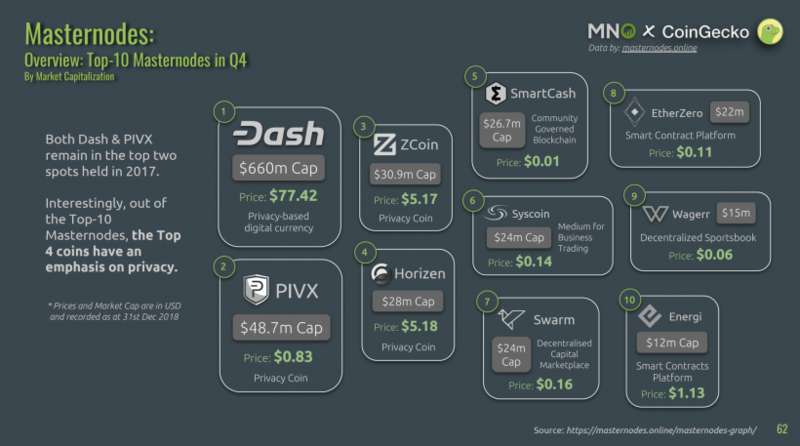 However, the market capitalization of masternode coins was also similarly affected by the decline in 2018. 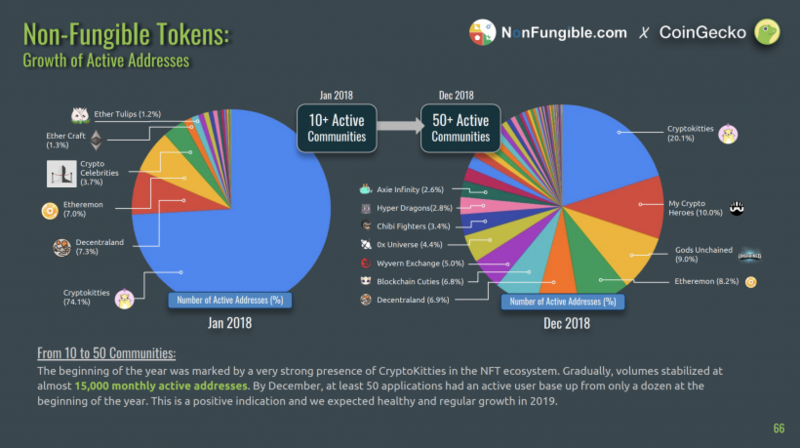 NonFungible.com reported that 2018 saw strong growth in the Non-Fungible Tokens space. At the start of 2018, CryptoKitties dominated the NFT space but by the end of 2018, we saw 50 strong communities emerging. There were roughly 15,000 active addresses participating in NFTs. 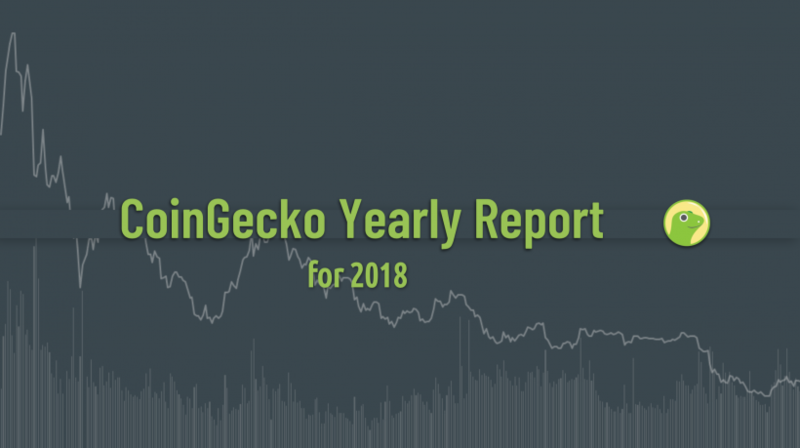 Similar to our previous reports, the 2018 CoinGecko Yearly Report is free to download and access. Here is a Slideshare embed of the report. Click the link below to download the full report. Feel free to share and quote our report in your tweets, articles, and blog posts. If you have any comments or suggestions to improve, do drop us an email at [email protected] and we would love to hear from you. @coingecko will read all meaningful comments we received on this Steem post. Please tell us what you think of the report and if you want to further support @coingecko, share the report on Twitter and tag us! We'll send a full Steem upvote your way.